Winter Bees & Formic Acid: Used right, a successful combination. Figure 1. Spring time hive inspection in Canada after treatment with MAQS in the previous Autumn. 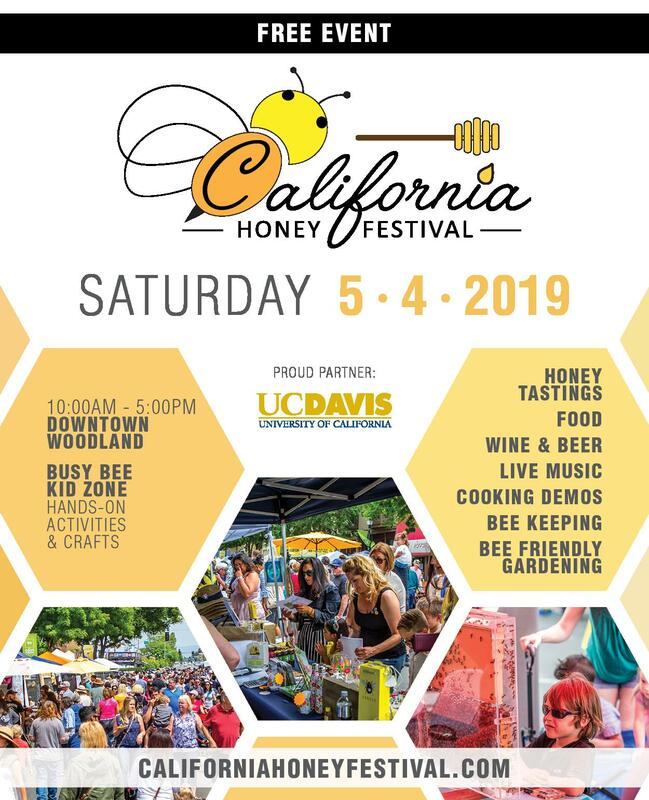 Honey bees (Apis mellifera) are fascinating insects in many different ways, but to me, one of the most interesting aspects of Honey bee life is the difference between Summer bees and Winter bees. Worker bees that hatch in Spring or Summer have an average life expectancy of 30-40 days1, whereas their sisters born in September or October are built to remain alive during the broodless period and throughout the Winter until the following Spring1. When the cooler weather arrives along with shorter days, the queen slows and eventually stops laying eggs completely. The colony shrinks from 20,000-60,000 bees in July to a modest 5000 bees that stay in the hive during the cool season2. These workers all attend to the queen, feeding her and keeping her warm until the following Spring. 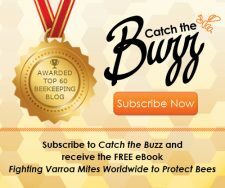 This overwintering process of Honey bee colonies has become much more vulnerable since the Varroa mite (Varroa destructor) began parasitizing colonies over two decades ago. Research studies from Canada and Germany conclude that Varroa mites are the main cause of colony loss and severely reduced colony strength in Northern climates3,4. To understand why Varroa pose such a threat to Honey bee colonies in the overwintering phase, let’s look at the correlation between Honey bee and Varroa mite populations over a full beekeeping year (Figure 25). The first thing we will notice is that the honeybee population and the Varroa population are not in synch5. The graph shows how the bee population starts to build up slowly in late Winter, then the build-up gains more speed in Spring until it peaks in June and July (Figure 2). In July, the number of workers begins to decline, and, depending on the climate the queen slows and eventually stops laying eggs altogether in November/December. The Varroa population lags behind the number of worker bees in the hive, because mites need the bee brood to reproduce. If the previous year’s treatment for Varroa was successful and the brood break sufficient, Varroa counts should be low. As the bees are expanding their brood cluster, the Varroa populations grow too. 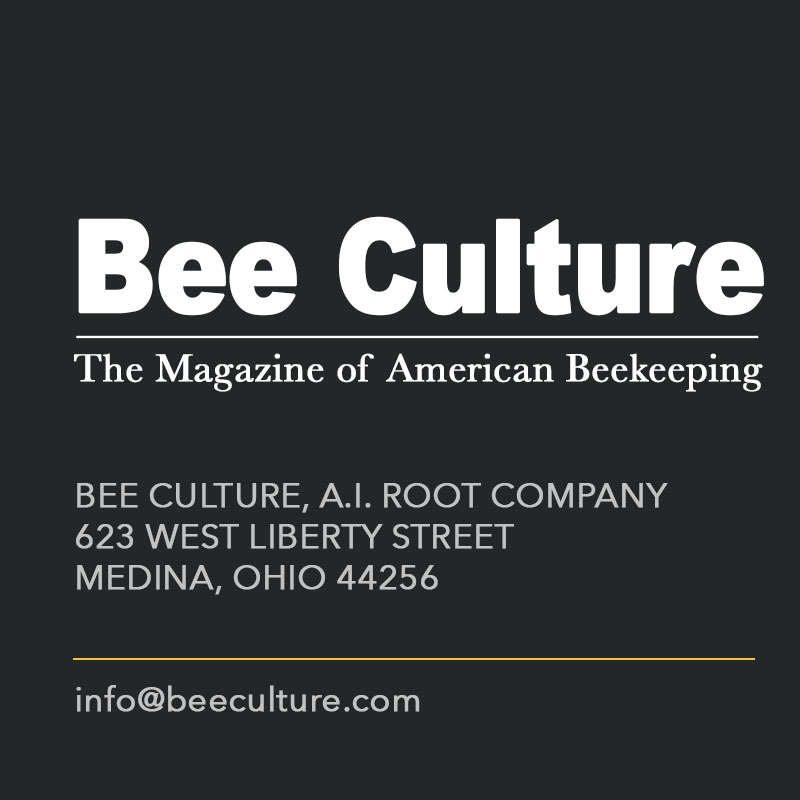 Mites then have access to a dramatic increase in worker and drone brood cells for reproduction, and a steady supply of Honey bee haemolymph, or bee blood, a Varroa staple6. But, there is one significant difference between the seasonal development of bee population and that of the Varroa population: The mites reproduce exponentially – as long as there is brood in the hive7. More specifically, the Varroa population doubles ca. every three weeks between springtime and the onset of the broodless period7. With such a sharp increase in the Varroa population over the season, you might ask yourself how to realistically stay below the threshold of serious colony damage until August or September. The answer is drone brood removal throughout the season6, and treatment during or in between honey flows. 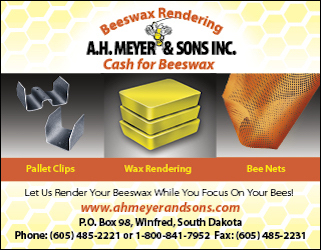 MAQS® Beehive Strips are an authorized Varroa treatment during honey flow8. 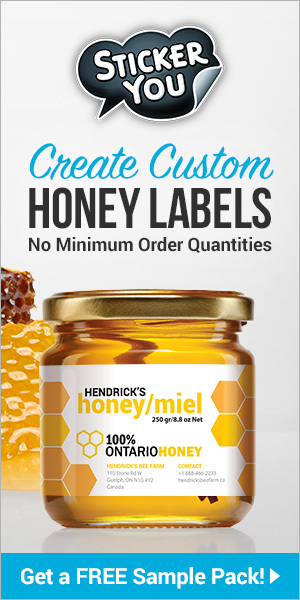 If you choose not to treat during honey flow, apply MAQS® in between two flows. Just make sure that your colonies have enough access too fresh air during the seven-day treatment period by fully opening your entrances, and pay attention to the required maximum daytime temperature range (between 10°C and 29.5°C)8. Figure 2. 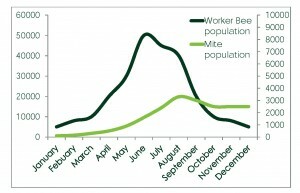 Worker Bee Population (dark green) and Varroa Mite Population (light green) throughout the year. With a late Summer or early autumn treatment, you want to eliminate as many Varroa as possible to protect your Winter bees. 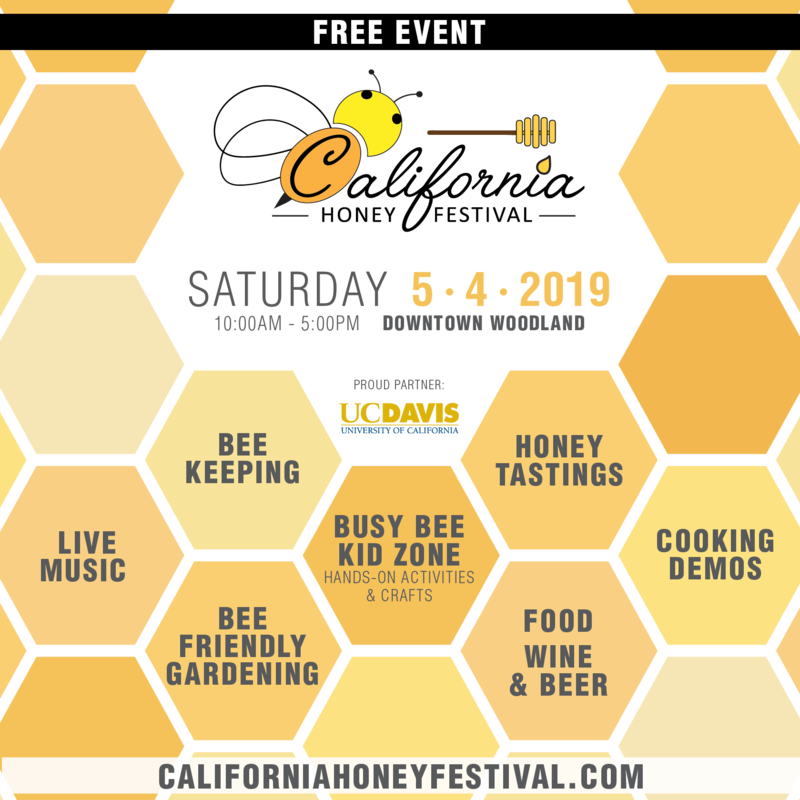 Remember, they have a (relatively) long bee life ahead of them, and “hand over” the colony to the next generation of Summer bees the following Spring. 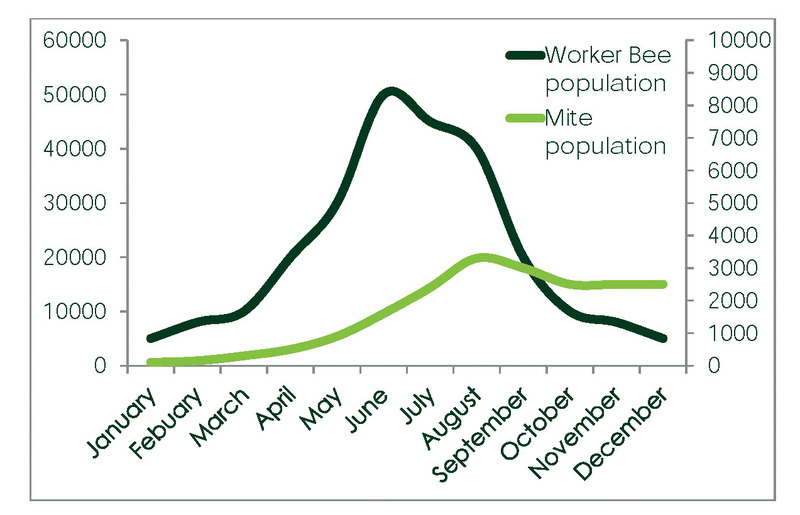 Looking at our graph again (Figure 2), we can see that the mite population increases even when the Honey bee population decreases. This means more Varroa for fewer bees. A high Varroa load during the cold season will also increase the virus load in the Honey bee colony9. This can lead to a shorter lifespan for Winter bees, reflected in pitiful springtime finds by the beekeeper of small groups of leftover bees in the hive, or complete colony losses9. Formic Acid, the active ingredient of MAQS®, is the best candidate for Varroa treatment in late Summer. First and foremost, it is the only available substance that targets mites under the brood cap where they reproduce6,10. Secondly, mite resistance against Formic Acid are presently unknown and also quite unlikely6. And finally, the Formic Acid in MAQS Beehive Strips is an organic acid that is not soluble in wax or honey, and vaporizes over time. MAQS® combines all of these advantages in a smart and easy to use dosage form, which offers a safe and much shorter treatment period compared to treatments with liquid Formic Acid. Figure 3. 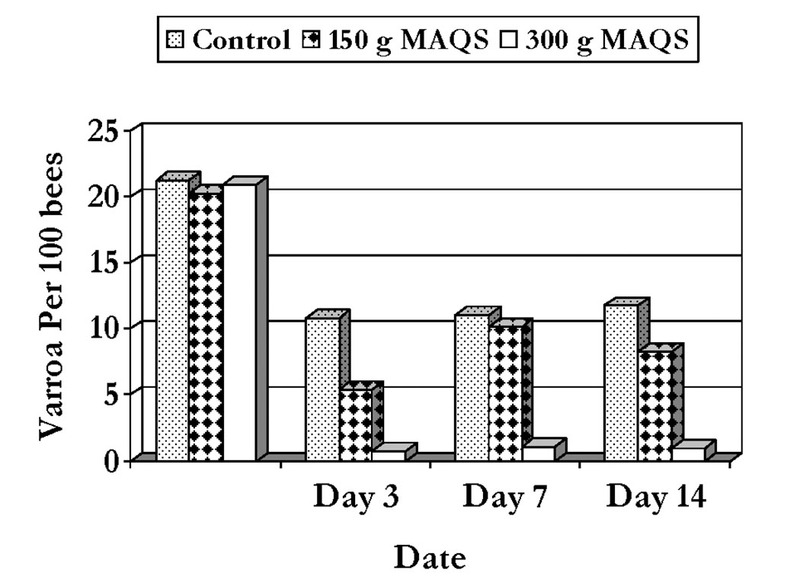 Varroa per 100 bees during Mite Away™ (MAQS™) treatment trial, Fall 200911. 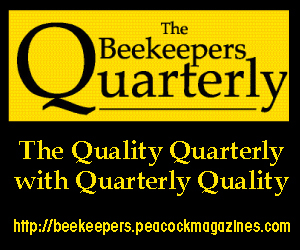 In early October 2009, the Ontario Beekeepers’ Association tested the long-term efficacy of MAQS and compared it to the efficacy of Apistan11. 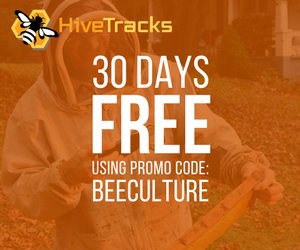 In this trial, colonies treated in late Summer with the full dosage of MAQS® (two strips per hive) had a mean mite count of 1.3 per 100 bees the following April. In those hives treated with the half dosage (one strip per hive), 2.9 mites were found on a sample of 100 bees. The Apistan-treated hives showed an infection rate of five mites per 100 bees (Figure 311. Pre-treatment infection levels for all three groups in this trial were above 20 Varroa per 100 bees. Moreover, the group of colonies treated with the full MAQS® dosage was also the group with the lowest Winter mortality (9%), whereas 42% of the Apistan-treated control group were reduced to drone laying workers, or had died off completely11. This test shows clearly how important the late Summer or early Autumn treatment is for the health and survival of your colonies over the Winter. To treat against Varroa successfully, it is crucial that you also monitor the treatment success after the treatment has been finalized. 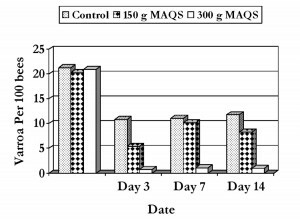 To see the full efficacy of MAQS® under the brood cap, we advise to check the treatment success after day 21 (three weeks after the application of the strips). At this time, all bees that were still under the cap during treatment will have emerged, and the dead Varroa from their brood cells will have fallen. If your colonies have suffered from a particularly high mite load before the treatment and you want to repeat it, you should wait at least a month between your MAQS® applications. 1 Mattlia HR, Harris, JL, Otis GW (2001) Timing of production of winterbees in honey bee (Apis mellifera) colonies. Insectes Sociaux, 48: 88-93. 2 The Hive and the Honey Bee, Dandant and Sons Inc, Hamilton, Illinois, USA. Revised 1992, Seventh printing 2005, pages 90 and 847. 6 Rosenkranz P, Aumeier P, Ziegelmann B (2010) Biology and control of Varroa destrutor. Journal of Invertebrate Pathology, 103: 96-119. 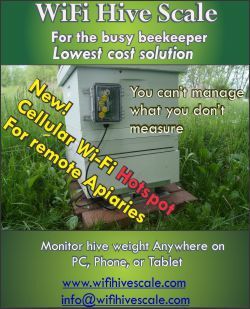 7 VanderDussen D (2006) Varroa doubling info: understanding the boom and assessing your varroa treatment time purchase. American Bee Journal, June 2006: 526-527. 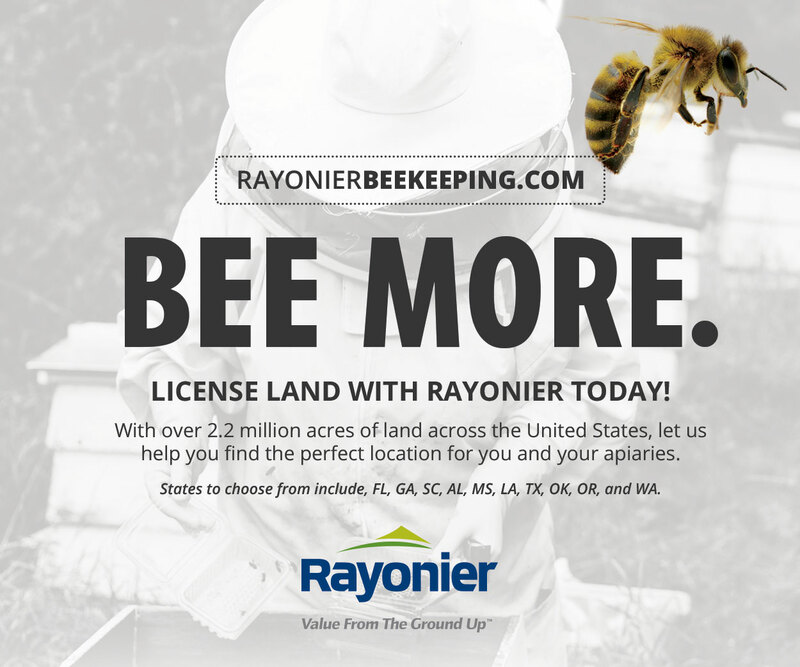 8 VanderDussen D (2013) A new authorized Varroa treatment – MAQS® Beehive Strips. Bee Craft, 95 (5): 9-12. 9 Dainat B, Evans JD, Chen YP, Gauthier L, Neumann P (2012) Predictive markers of honey bee colony collapse. PLoS One, 7 (2): 1-9. 10 Lampe U (2015) Targeting all Varroa mites in the colony. Bee Craft, 97 (2): 24-25. 11 Van Alten A, Tam J, Kempers M (2010) Winter colony health assessment after using Mite Away™ Quick Strip (MAQS™) as a control for Varroa mites in the fall of 2009. 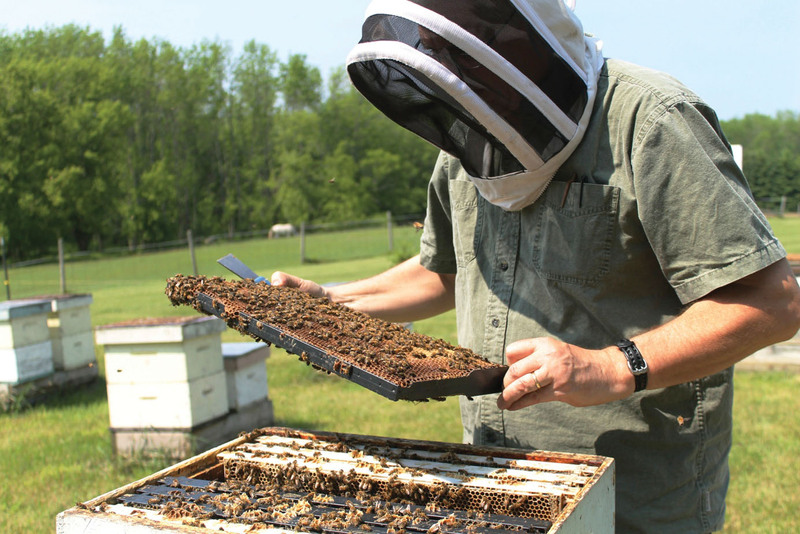 Study Report Submitted to the Ontario Beekeepers’ Association. 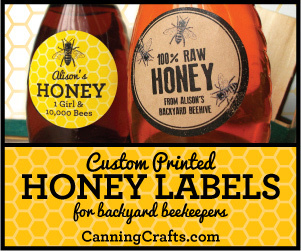 Previous articleNew Products: Books – Simple Smart Beekeeping; Honey (cookbook); Beekeeping for Dummies, Third Edition. 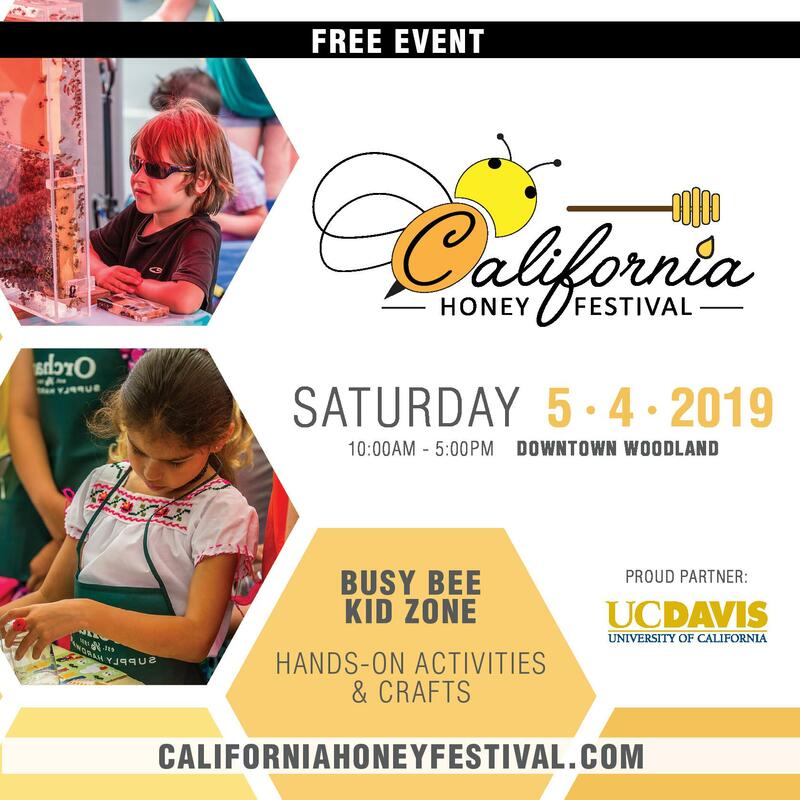 CATCH THE BUZZ – A Key Observation Was That Orchards Fare Best When They Have a Diverse Community of Bees Flying in From Natural Habitats. 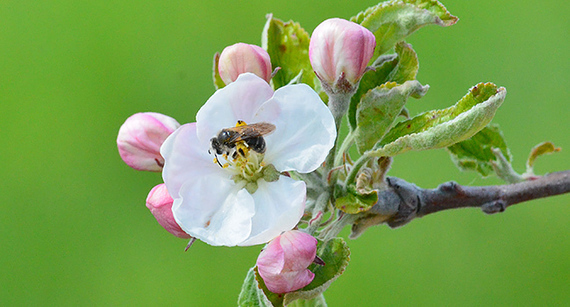 CATCH THE BUZZ – Plant Diseases, Pests Ruining Crops, In Some Cases Up To 40% – Just Like Bees! CATCH THE BUZZ – Fish and Bees “Talk” with Help from Robot Translators. 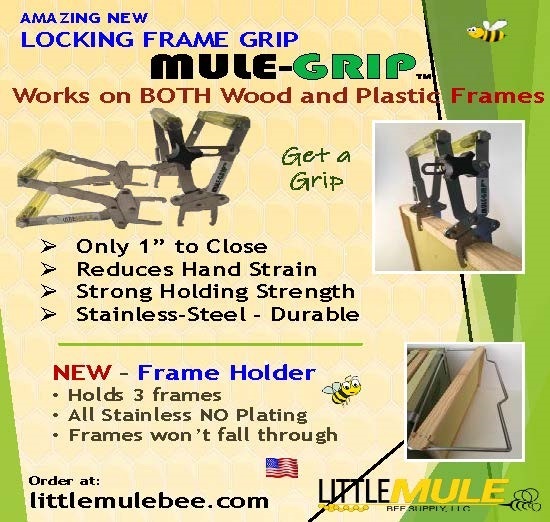 CATCH THE BUZZ – Just So You Know, The Flow Hive Has Been Redesigned.